The coroner has identified a pregnant teenager who was killed in an early morning crash in the South Bay on Wednesday. 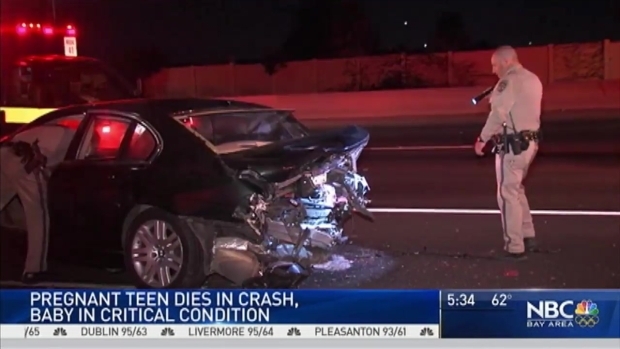 Dulce Capetillo Hernandez, an 18-year-old resident of San Jose, was the passenger in a 1998 Honda Civic that was involved in a two-car collision on U.S. Highway 101 in San Jose around 1:50 a.m. Wednesday, according to the Santa Clara County medical examiner's office. Capetillo Hernandez, who was also known as "Dimplezz," posted on her Facebook page that she was a "Mommy to be" and attended Independence High School in East San Jose. A GoFundMe page has been made by Capetillo Hernandez's aunt Yesenia Ortiz to raise money for the young woman's funeral. The teenager was seven months pregnant when she died and leaves behind a premature baby boy, Ortiz said. An investigation is underway into an early morning traffic accident that left a pregnant teenager dead in the South Bay. Bob Redell reports. By Thursday, people had helped to raise $380 of the family's $10,000 goal. The newborn remains in critical condition, according to Santa Clara Valley Medical Center spokeswoman Joy Alexiou. The California Highway Patrol noted that there is not much shoulder room along the freeway and it's certainly not enough space for two vehicles at once. But that's what happened when the 22-year-old Honda Civic driver veered off the road and hit the rear end of a parked and occupied 2002 BMW 745i, investigators say. The three people involved in the collision reported minor injuries initially. The man driving the Honda Civic and the other in the BMW were taken to Regional Medical Center of San Jose. Doctors found Capetillo Hernandez had suffered traumatic injuries to her torso. She died at 5:30 a.m. in the hospital's operating room. An investigation is underway into an early morning traffic accident that left a pregnant teenager dead in the South Bay. Robert Handa reports.